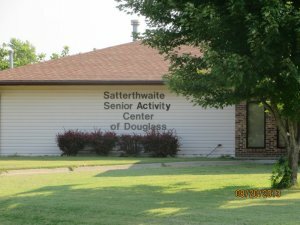 The Douglass Senior Center is located at 124 W. Fourth Street, Box 362, Douglass, KS 67039. The building was completed in November, 1997. The Douglass Senior Center would like to express thanks to all those who have been involved with the Senior Center over the years. We have several volunteers every weekday that help serve lunch and deliver meals to several homes in the community. The Douglass community can be proud as we have one of the finest facilities in the state, thanks to many hardworking folks in this community. It takes the involvement of the entire community for the Center to function. We certainly want to make everyone aware of this and encourage you to become involved. Anyone fifty years or older can become and membership dues are just $1.00 per year. There are a number of scheduled activities available that might be of interest and that encourage enjoying the fellowship of other community members. Also, if you have any ideas of other activities we might do, we would appreciate you sharing them with us. We would like you to know that we have full time cooks and serve or deliver home cooked noon meals every weekday for a donation of only $4.00. For those that qualify, there is a program that can help with that cost. We do ask that you call in by, or before, 9:00 a.m. to let the cooks know you will be joining us for lunch or need lunch delivered. This helps them to know the right amount of food to prepare for the day. We have menus available each month. Additionally, we serve a breakfast on the third Saturday of every month from 7:00-9:30 a.m. that’s open to the public for a donation of $5.00. We truly hope this information is helpful to you and that you would consider becoming involved in the great efforts provided by your local Senior Center. If you have any questions, please contact the Senior Center Director, Peggy Bannon, at 746-3227. We welcome you to stop by and visit the Center, and if you’re interested in being a member or a volunteer, we’d be most happy to have you join us.